First off this fine summer day, a quick plug for our friends at New Day Family Services (http://www.ndnm.org). Every year they host an amazing concert to build awareness for their mission to help at-risk youth and to raise money for their programing. And every year we like to support them and to help advertise the show. This year they will be bringing Widespread Panic to Sandia Casino Amphitheater on Friday July 11th. Check their web site or Ticketmaster for tickets. It will be a great time I can assure you. My second plug for the week is food related. Last week we launched our line of green chile sauce (hot & medium), red chile sauce (hot & medium), and a yummy BBQ chipotle sauce for the summer grilling season. All of them are now on the web site to add to your Harvest Box or buy through the shopping cart. It dawned on me that being a New Mexican farm and food provider, we need to have consistent supplies of chile or we are just not doing our jobs. So these sauces will help supplement our members throughout the times of the year that we do not have frozen roasted chile from the farm. We did a lot of taste testing (tough job!) to find these recipes, I think you will really appreciate the flavors and quality of these sauces. Enjoy. On the farm front, things are really picking up steam as the cool spring becomes our typical sunny warm days. Cucumbers are going crazy and will continue to provide a steady harvest for several weeks to come. Summer squash is a little behind our normal schedule but will be hitting the scene here soon as well. 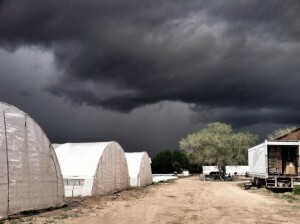 We got hammered by a pretty serious hail storm this week and fortunately we did not sustain more damage than we did. The greenhouses literally saved our tomato crop this year. Hail hits a farm like a pair of scissors just shredding whatever it is in its path. Leaves or fruit will be ruined by the hail and cannot bounce back most of the time. Our last harvest of lettuce looked like it had been run through a paper shredder. So that will be it for our spring lettuces. All things considered, we dodged a huge bullet and should have an abundant summer after we clean up the mess. Seeing freak flash storms like that always acts as a good reminder of the tenuous nature of farming. A 10 minute storm could wipe you out for the season and then miss your neighbor completely. This brings some serious respect for the power of Mother Nature. Lastly this week are some notes about delivery days. If you have been around the farm for more than a week you know that we love to throw spaghetti against the wall, see if it sticks, and then build our business plan around what makes sense for the long run. No focus groups around here. Launch ideas quickly, assess viability in real time. Saturday delivery days have been around for about a year. The idea was good, but members are not taking advantage of this service enough to make it viable for us financially. So we will be phasing this out to hopefully a) stop losing money on those Saturday routes, and b) to increase the density of our weekday routes. Ultimately making the model more efficient financially and environmentally. Our business is interesting in that regard—if we base our decisions on what is best for the environment, it usually makes more sense financially as well. Having more orders per delivery truck is better for Mother Nature and our bottom line. Sourcing from growers closer to home means less miles on the road and less money pumped into the gas tank. These are just 2 examples of the many we see. So look for this Saturday change-up and I appreciate your understanding on the necessity of this change. All members west of the river can still choose to receive orders on Wednesday during the day or Monday nights. All members east of the river will have the options of Tuesday or Friday for delivery. So I feel good knowing that although the delivery day is changing, all of our members have plenty of convenient options to choose from. I did something that I usually never do. And before my guilt eats me alive, I want to share it with you and ask forgiveness…I went into a produce section at the grocery store. After a brief anxiety attack, I was able to do what I came for—price check our food. I have to admit that I am pretty oblivious to what the “market price” is for produce these days. But recently I had some folks ask me how our Harvest Boxes compare in price to the grocery store. Instinctively I always say “we’re very competitive,” but then I felt the need to fact check myself before someone calls me on it and I end up looking like a burro. So armed with a piece of paper and the calculator on my phone, I dove into the produce section. For ease of numbers I just dissected the Medium Harvest Box, 12 items, $36, all Organically grown. First note was that I could only get 9 of the 12 items to be Organically sourced and none of the 12 were locally grown compared to our’s all Organic and 3 locally grown. The total tab at the register would have been $40. Honestly I was hoping for more than a 10% savings, but then the light went off in my Norwegian noggin– that 10% savings did not take into account that we deliver to your doorstep. Furthermore, with us, you can shop in your underwear which has got to bring some value too doesn’t it?? So at the conclusion of my comparison shopping, I felt very good about the numbers. If we can save you money, save you time going to the store, bring you locally grown items, and run a socially responsible business model, then I think we are doing a good job. But just like report cards in school, it is good to stop and evaluate things every now and again. And this report card I am happy to show my mom. But the numbers only tell a part of the story I think. The interesting thing to me is what lies behind the numbers though. As the Notorious B.I.G. reminds us all “This situation ain’t accidental.” So how in the world is a small farm able to compete (and beat) the prices of larger retailers who have an obvious size advantage? The answer is pretty darn simple and it is what we looked at in last week’s newsletter—partnerships. Direct partnerships cut out the middlemen and get food to your mouth fresher and less expensively than any retailer is able to offer. Even the big retailers are swimming in a matrix of middlemen. Products changing hands and warehouses so many times it will make a head of broccoli dizzy. Direct partnerships are the only way to go to outfox the box stores. I know I beat this drum a ton, but it cannot be overemphasized. It is the future of small scale food. On this note, I want to let you know about a great move that we just launched this week too. We have finally cracked the logistical code to begin home delivery in the Las Cruces area. I know many of our members are saying, “Sheesh, it’s about darn time Farmer M.” And they are right. This move has been long overdue but nonetheless, better late than never. So this Wednesday, 5/20, will be the maiden voyage of our delivery trucks in the land of milk and honey, or maybe it was milk and Aggies?? But the distribution is a tip of the iceberg for us. This is not just a move to increase sales. It is a chance for us to work with local growers to bring their food to a larger statewide group of foodies. I had a great conversation with Jay Hill in Las Cruces this week about getting him on board to grow for our CSA and to transition fields away from conventional growing into Organic practices. 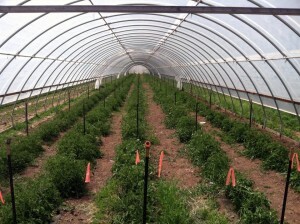 Many growers want to grow Organically, but just want to know who will buy their food. We/you help bridge this gap. To truly change the local food system, we have to address both consumers and suppliers. This is not a one-sided issue we tackle. Farmers and communities must move together. First off, I want to thank everyone who came out last weekend for the Plant Sale. Great turnout and I have to say I love hearing from folks about all the success they had last season with our plants, so they needed more this year. We have trialed so many varieties of plants over the last 13 seasons, that it feels good to pass along plants to you that I know for a fact that grow well here. Too many times, nurseries sell you plants that are not acclimated to NM so they don’t grow well here (go figure). The plants that we grow in our fields are the ones we sell to you. We talk a lot around here of setting up systems for success, not failure. And when folks are taking our plants home, I know they are setting their gardens up for success. On another, more regional note, I want to share with you a little bit of what is going on in the larger food movement. Unless you have been working on a research station in Antarctica, like our own Cameron Banks has done, you know that California is in the midst of a serious drought and water shortage. This is just beginning and will continue to show greater strain on the country’s food supply. Dairies and farms have already begun the relocation process to areas with more water, like Oregon. So the water situation is not being over emphasized by the 24-hour news machine, this is a very real situation. As you probably already know, I am a food nerd and have my finger on the pulse of the food systems both locally and regionally/nationally. About a year ago I started to see the price of produce going up pretty significantly. This usually happens when a storm or some event hammers an area. The difference this time, is that the storm has not and does not look to be passing. Here is my crystal ball amigos. We will see food prices shoot up probably fairly quickly. Sooner or later the cheap gas and cheap water that our society has been subsidizing will collapse like our cheap money collapse of 2008. At this point we will be in a dark moment, but we will also be on the verge of a new food system. The large industrial ag of California will splinter and disperse to various regional areas. 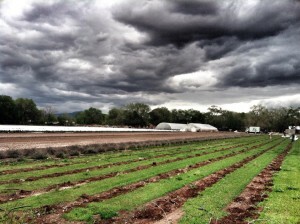 Did you know that southern Colorado used to be a huge producer of spinach and carrots? Those days could return. The farms will move to where the water is and that will mean more regional players who are closer in proximity to their markets. This regional farm model will mean less fuel to transport over long distances and less concentrated agriculture in one area which is better for the environment. They say that it is the darkest hours before the dawn, and I honestly believe this to be true. I am an optimist at heart, as all farmers are I think, and we will see some cool things transpire in the coming years. So stay tuned. How will this affect your farm you may ask. We are currently increasing our efforts to partner up with more regional farms to help insure that you (and me) have a consistent fresh food supply as the situation in CA becomes more dire. The support that we are able to provide a grower through our CSA is very enticing to a potential partner farm who is looking to sell more food. We have made great strides in this direction in Colorado and now are really trying to find a few more growers in Arizona to help round out our year-round salad bar. We are so fortunate in the Southwest to have such an amazing growing region. We look forward to bringing even more growers to our CSA party. We get by with a little help from our friends.